Last week we brought you a series of blogs about celebrity home exteriors. So now you’ve seen what they look like from the outside, we thought you might like to see for yourself, just how celebrities really live. Today we’re taking a look inside some homes of the rich and famous so you can see exactly what a celebrity home really looks like – you may find some surprises. The leading star of Glee, you may expect Lea Michele to be just as diva-esque in real life as she is playing Rachel Berry in Glee. However, she couldn’t be more different. You only need to look inside her grown-up abode to see that she takes pride in the appearance of her home. She has introduced a nature-like calming feel into her home that can be seen from these leaf-patterned lamps. 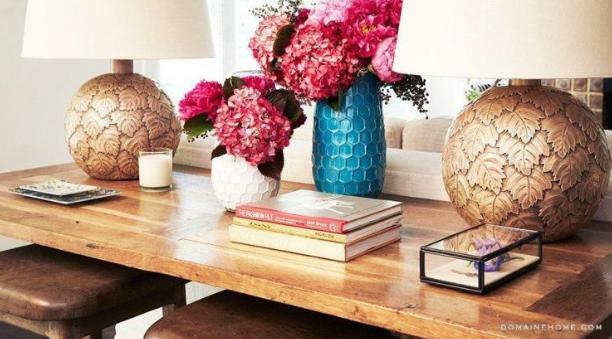 Displaying fresh flowers in your home will add a pop of colour and a feminine touch. Take a look at our garden centre to find some indoor plant accessories. For top designer Ralph Lauren simplicity is the key to a happy home. Take a look at his spotless kitchen – now that would be easy to clean! Kit out your kitchen to perfection using our kitchen accessory products – who said the ideal kitchen has to be expensive? Find out more about celebrity homes on our Facebook and Twitter pages.